Shimla : At Least Six persons were killed and 19 injured when a private bus fell into Machhada Khud near Rampur in Shimla District of Himachal Pardesh this morning. Some more persons, including a child, are reported to be missing and feared to have been washed away after the accident that occurred about 120 kms from State Capital Shimla. 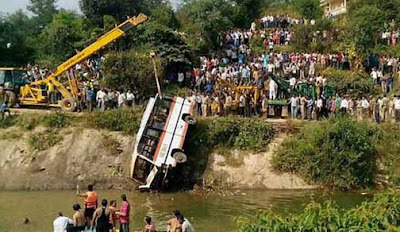 The death toll could rise as the exact number of people travelling in the bus is yet to be ascertained, police said.Rescue efforts are on. Six bodies have been recovered and all the injured have been rushed to hospital at Rampur, they said. The bus was on its way from Rampur to Shimla when it fell down into the Khud at Machhada bridge. Soldier Narinder Verma, who escaped with minor injuries, said that possibility of some bodies being washed away into river Sutlej could not be ruled out.The accident led to a traffic jam and district administration had a hard time in rescuing the victims and retrieving the bodies.